Peter Oxley - Shelving & Racking Ltd.
Our main office has moved, but only over the road! Our new office address is Star House, road and postcode remain the same. We are really busy at this time of year, with lots of orders going in before the end of the financial year and with new budgets for the next financial year. New and used pallet racking is coming and going from our warehouses every week, and we can usually offer free delivery to UK mainland addresses. Email us with your requirements now and we’ll send a low price quote as soon as we can. We specialise in quality used pallet racking and can deliver anywhere in the UK mainland. We currently have in stock a good supply of second hand Dexion, Stow, Redirack, Hilo, Link and Esmena warehouse racking, fill in an enquiry form for our best price. If you are looking for cheap but effective storage for your office, workshop or warehouse then our clip together shelving is a fantastic solution. With many size options and extra shelves available, these easy to build units are ready to despatch quickly and can be delivered anywhere in the UK mainland. We have some bargain offers available on this type of shelving, so get in touch while stocks last! Our new Quickspan shelving is fantastic for hand loaded storage in a warehouse, manufacturing or archive environment. Available in a wide range of sizes, and for delivery anywhere in the UK mainland, let us know what you need using the Longspan quote form and we’ll get back to you with a great price. If you are looking for a supplier of quality racking accessories, you’ve come to the right place! Our warehouse near Leeds, West Yorkshire has an extensive range of column guards and barriers, timber decks and pallet support bars for delivery anywhere in the UK. Lots of orders going out in the next 10 days, so if you have an order to place and you are in London, Glasgow, Nottingham, Gloucester, Liverpool, Coventry or Huddersfield get in touch now for a great delivered price. We are currently offering some amazing discounts on used Shaeffer, BS and Link warehouse shelving. Send us your details on an enquiry form now as stock is limited! We have deliveries going to Leeds, Bristol, London, Manchester, Coventry and Nottingham this week. If you have an order for that area, contact us now and we may be able to offer FREE DELIVERY. Check out our growing range of trucks, trolleys and mechanical handling solutions, available to order NOW! We have large quantities of used pallet racking in Metal Sistem, Stow, Redirack and Dexion P90 Silverline, all in excellent condition. Let us know your requirements by filling in a Quote Form. Our Longspan shelving and our rolled edge systems are ideal for file and archive box storage. We are offering a further discount on all clip-together shelving systems. We have pallet racking deliveries going to Leeds, London, Hull, York, Newcastle, Liverpool and Birmingham next week, if you have orders for these areas let us know quick an dwe may be able to offer free delivery. Check out our new range of Protective Barriers and Posts, for pallet racking protection, pedestrian access and for protecting machinery from fork lifts or pallet trucks. We have just received a huge amount of superb quality Used Longspan Shelving give us a call while stocks last. Use our quick quote form for our latest stock and prices on second hand warehouse racking. Have a look at our new range of access equipment, from mobile steps for use in a heavy duty warehouse environment, order picking from shelving or pallet racking, or for lighter duty office or storeroom use. If you need something to your own specifications we can make bespoke items to order. We have Scheduled deliveries to Liverpool, Southampton, Portsmouth, Norwich and London next week so if you have orders for these areas get them in quick. Wow what a busy build up to easter! lots of you getting orders in before the bank holiday. If any of you need quick quotes for used pallet racking going to Leeds, Bradford, London, Manchester, Birmingham or Sheffield get them in quick as we have already scheduled deliveries. For cantilever racking enquiries use our contact form and we will get back to you quickly. Use our quick quote form to select required dimensions. 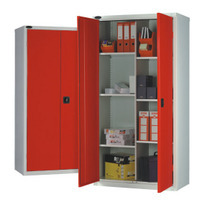 Have a look at our sturdy and practical range of industrial cupboards choose from a variety of strong colours to suit your working environment. We also have a large amount of Dexion Speedlock arriving shortly. Our new range of easy to assemble clip together shelving is in stock and ready to go. Watch this space as more sizes are coming soon. We are having a really busy January so far – Lots of people looking for great deals on new and used racking and we are not dissapointing! We currently have large stocks of Apex , Dexion , Hilo, Link 51 and Redirack. If you have any to sell send us a message or give us a call. We have added hundreds of special offer bundles on our new heavy duty pallet racking. Just hover over ‘new speedlock pallet racking’ on the left hand menu or just send us a quick enquiry and we will send you our best price. Our new range of clip together warehouse shelving is a great medium duty option for factories, warehouses, storerooms and workshops and is very easy to assemble. If you need decking levels for your racking there are several options. Timber Decking – Economical and sturdy option. an open boarded timber deck sits on the beams and timber batons prevent movement. Identify pallet racking brands here . It is important that you correctly identify pallet racking as no two systems are compatible. Quickspan is the perfect solution for manually storing small to medium size products. It is easy to assemble and increadibly strong and sturdy. It is designed the same way as pallet racking: with upright frames and horizontal beams, but is lighter duty and suitable for hand loading rather than loading with a fork truck. Chipboard or steel shelving is used for decking. Fill in the quick quote form and we will get back to you with our best price in minutes. We have just added new products to the Racking Protection section of the site, look here for great prices on Column Guards, Narrow Aisle Column Guards, Heavy Duty Column Guards, Modular Rack End Barriers and Tubular Rack End Barriers. We now sell Timber Decking levels and Wire Mesh Decking at great prices look in the accessories section of our site. We are offering great discounts on Clip Together Shelving an extremely easy to assemble medium duty shelving suitable for loads up to 200kg/UDL per shelf. Each bay comes with 5 shelves and come with joining plates if you are connecting more than 1 bay. An exceptionally busy few weeks for us has included used pallet racking deliveries to Leeds, Manchester, Birmingham, London, North East, Scotland and Wales. Our longspan shelving continues to be a best seller. Use our Quick Quote Forms for our best price on pallet racking, longspan racking, shelving if you’re not sure what you need just fill in as much information as you can and we will get straight back to you.